After star hoping for a number of years with a Celestar 8, I traded it in on the Nexstar 11 GPS in September 2001. This scope is an amazing piece of technology considering its price. Watching it find north, link to the GPS satellites and slew to the alignment stars is always a crowd pleaser! 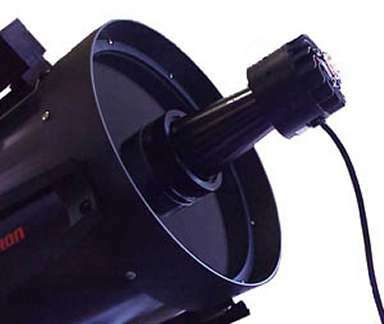 Celestron is continuing to upgrade this scope and making these upgrades free to existing customers. The optics on the scope are outstanding and goto accuracy will put objects on the CCD chip. The two major reasons I purchased this scope was for its goto capability and as a platform to try my hand at astrophotography. The scope offers fastar, permanent periodic error correction (PPEC), good tracking capability and even a database of suitable CCD objects. There is also full backlash adjustments on both axis. So far I have been extremely pleased with this scopes performance. The one area that lets this scope down as an imaging platform is its tripod. As the scope weighs close approx 30kg this taxes the limits of the mount. 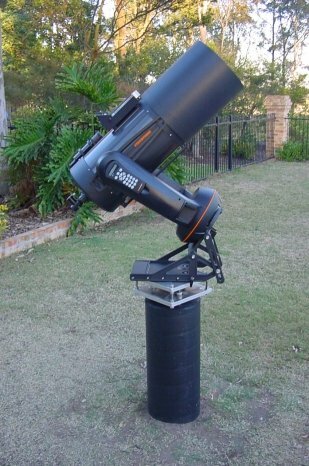 A number of other N11GPS owners have used Meade giant field tripods or Losmandy tripods to prove a stable imaging platform. I made a permanent pier and modified the wedge as can be seen in the photo. For details of the pier design click here. I purchased this scope as a wide field "grab and go". Its quite light as I can carry the ota with Alt-Az tripod attached in one hand. It was quite cheap and to my pleasant surprise the optics are quite reasonable, showing nice concentric circles. As it is a achromatic there is false colour, but 75% of this can be eliminated by a MV1 filter from Sirus Optics. Using a 32mm eye piece you can achieve almost 4 degrees field of view. This proves some spectacular views of the milky way. The ST-237a is a great little camera to start off CCD imaging with. I purchased this unit second hand which included its internal colour filter wheel. The major reason for purchasing this camera was its ability to be used in fastar configuration. I'm also now finding with the FR-237 focal reducer, this camera works equally well in the primary focus position on the N11GPS. I've used this camera to take a number of planet eye piece projection shots on the N11GPS. I purchased an adapter from Scopetronix to mate the camera to a 1 1/4" eye piece. The shots are available on the images page. I purchased this camera new back in 1986. It's proved to be a good camera for astrophotography. It has a bulb setting and a electronic cable release to ensure now vibration when the shutter is opened. Even though it has an electronic shutter, the camera uses 2x AA batteries, so I've had no issues keeping the lens open for an hour at a time. One of the attractions to the N11GPS was its Fastar capability. Currently you can purchase lens for both the 8" and 14" Celestron SCT's, but not for the N11GPS even though it has been on the market since August 2001. Starizona has now designed their own fastar compatible lens called the Hyperstar. 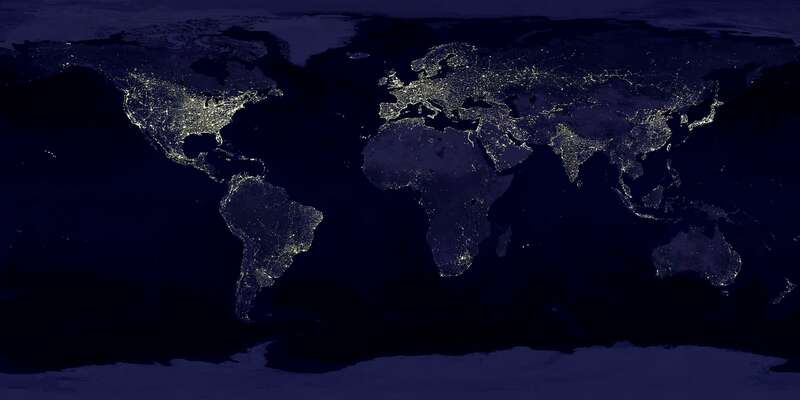 Starizona employed a NASA optical expert to do this. First impressions of the lens is that's its superior to Celestron's lens offering a faster F ratio at 1.8 and no vignetting. At this stage the Hyperstar will only work with the ST-237a. Have a look on my links page for more info on the fastar / hyperstar. This guider is used to attach my canon T70 to the N11GPS for film based imaging. It works very well as a guider once you can track down a bright enough guide star. For some excellent tips on using the GEG click here.